When people think about the types of preventative maintenance that they need to perform on their homes on a regular basis, one area that doesn’t get nearly as much attention as it should are the appliances contained inside. In that regard, it can be helpful to think of home appliances like water heaters as similar in concept to your car. You need to make sure that you’re getting tune ups, oil changes and other types of preventative maintenance services performed regularly to help identify small issues that naturally occur over the lifespan of a car before they become much bigger and more expensive ones. The same logic is true with appliances, only instead of suffering only a massive system failure, an appliance like a water heater could suddenly flood your home and cause thousands of dollars in damage before you even realize you have a problem. You can prevent water damage from water heaters in your home by carefully following a few key steps. For starters, you should be replacing your water heater every seven to ten years for the best possible results. Though some people may balk at the admittedly large expense that a new water heater will represent, the alternative is much more costly. If you let your water heater go for too long and it bursts, flooding the basement or first level of your home, you stand to lose thousands of dollars of personal items in one fell swoop. That is to say nothing of the huge amount of irreplaceable items with sentimental value that can be lost in the same way. Not only that, but by replacing the water heater in your home at that level of frequency you can help make sure that you always have a model that is operating at peak efficiency with all of the latest technological advances. Another way to prevent water damage from your water heater is to have it inspected by a licensed plumber every year. A licensed plumber will be able to check for certain “warning signs” that an issue may be on the horizon like leaky gaskets, pipe corrosion and more. Remember that just because it does not appear that an issue is brewing with your water heater doesn’t mean that there aren’t warning signs. One of the most important things that you can do to prevent water damage from your water heater is to have the tank flushed every six months to a year. The act of flushing the tank will prevent sediments from settling at the bottom of the tank, which if left unchecked will lead to the rusting of that bottom portion at some point in the future. The rust will begin to build up on the inside of the tank, so by the time you actually see the rust yourself on the outside it will be far too late. Even if you have not yet suffered water damage, you will still need to replace the unit – which is something that could be prevented by regular flushing from a licensed plumber. Some of the best ways to make sure that your water heater will not cause water damage in your home involve making sure that it is installed in the right way. You should always have the tank on the main level of the home, for example, preferably on a concrete floor. 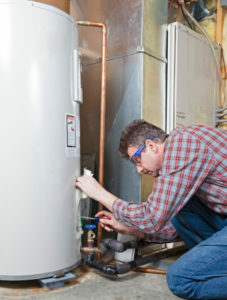 Additionally, you should keep your water heater near some type of floor drain in the event that it does begin to leak. Finally, you should keep your water heater well insulated during those cold winter months of the year. Water heater closets that are outside the home are very popular for keeping such a large appliance out of sight, but they are also prone to freezing when the weather starts getting cold outside.